Auckland: After the 80-run hammering on Wednesday, a desperate India will be eyeing for a strong comeback against New Zealand in the second contest of the three-match Twenty20 rubber at Eden Park here on Friday. While the visitors face a must-win situation, another victory for the Kiwis will seal a moral series victory win for them. In the first game, neither the Indian batsmen nor the bowlers clicked as they succumbed before a clinical all-round show by the hosts. Kiwi opener Tim Seifert (84 off 43) hammered the Indian bowlers all around the Park on Wednesday and it would be crucial to pack back him early on Friday. 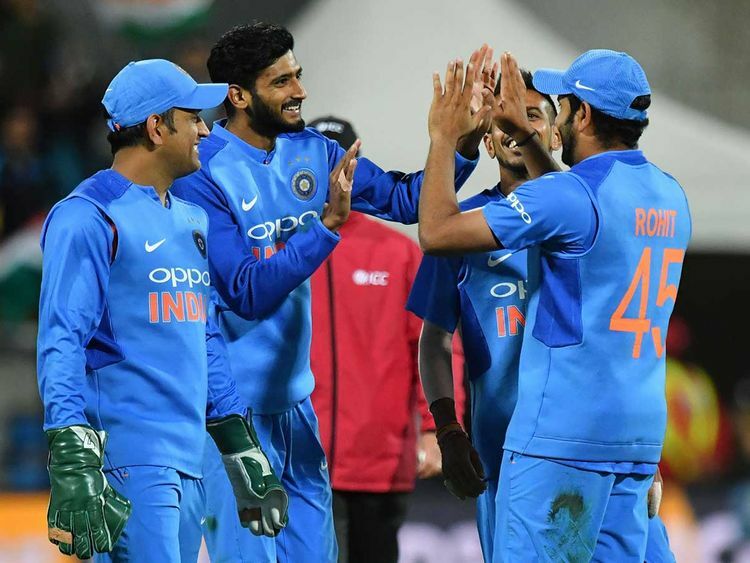 Experienced pacer Bhuvneshwar Kumar, Hardik Pandya and Khaleel Ahmed had failed to contain Seifert. In such a crunch situation, the Indian team management could replace Khaleel with either Siddharth Kaul or Mohammad Siraj, who missed the last game. A lot will also depend on the batsmen, who too, had surrendered as none other than Mahendra Singh Dhoni (39 off 31) showed any fight in the last issue. Despite going with eight batsmen, India were wrapped up for a paltry 139, suffering an 80-run defeat - India's biggest defeat in T20 in terms of margin. While trying to strengthen their batting, India went in with all-rounder Krunal Pandya and stand-in skipper Rohit Sharma will likely opt to select the service of chinaman Kuldeep Yadav, dropping the former. Mostly, Kuldeep has been economical during the slog overs and as India leaked too many runs in the middle overs in last game, the chinaman has a strong chance of making to the playing eleven. On the other hand, the hosts almost ticked all the boxes and will like to continue with the same momentum on Friday. With the top-order firing, the only major cause of concern for them is lack of support from the middle-order, which had a lacklusture outing in the last game. Apart from veteran batsman Ross Taylor, none of their middle-order clicked. Their bowling, spearheaded by pacer Trent Boult, was far more than impressive while the spinners Ish Sodhi and Mitchell Santner also supported the pace attack handsomely. Overall, an interesting contest is up on cards for fans on Friday. New Zealand: Kane Williamson (Captain), Doug Bracewell, Colin de Grandhomme, Lockie Ferguson, Scott Kuggeleijn, Colin Munro, Daryl Mitchell, Mitchell Santner, Tim Seifert (wicket-keeper), Ish Sodhi, Tim Southee, Ross Taylor, Blair Tickner, James Neesham. India: Rohit Sharma (Captain), Shikhar Dhawan, Rishabh Pant, Dinesh Karthik, Kedar Jadhav, M.S. Dhoni (wicket-keeper), Krunal Pandya, Kuldeep Yadav, Yuzvendra Chahal, Bhuvneshwar Kumar, Siddarth Kaul, K. Khaleel Ahmed, Shubman Gill, Vijay Shankar, Hardik Pandya.